Three people are charged with a July 10 murder. 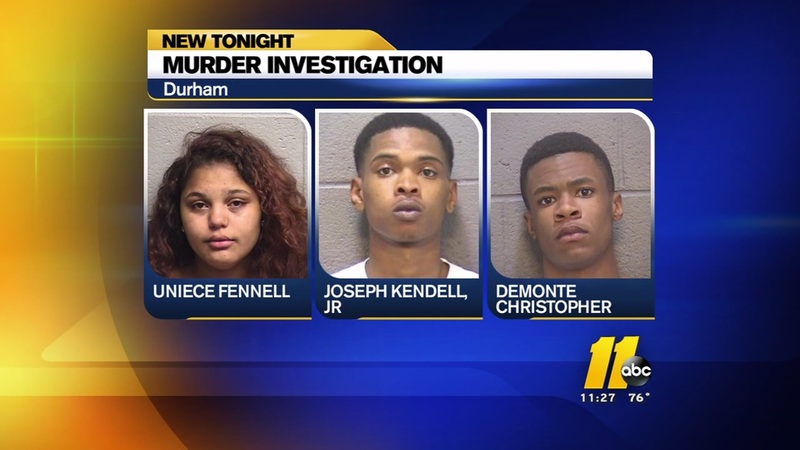 DURHAM, North Carolina (WTVD) -- A third person has been arrested in connection with a homicide that took place in July 2016 on Woodview Drive. Officials said 19-year-old Demonte Christopher was arrested in Atlanta, Georgia. He was wanted on charges of murder in connection with the Andre Bond case and felony probation violation from Durham. Christopher is currently being held in the Fulton County Jail in Georiga. In July, police said a drive-by shooting happened in the 2000 block of Woodview Drive just before 4:15 a.m. According to police, Bond, 19, was pronounced dead at the scene. Authorities also said the shooting did not appear to be random. Investigators arrested 16-year-old Uniece Fennell and 21-year-old Joseph Kendell Jr. and charged them both with murder. Investigators said the victim and suspects knew each other.